Completing the Registration Form and emailing it to ipcn@ipcn.nsw.gov.au. We will then notify you if your request to speak has been accepted. Because we know some people find public speaking trying, and there will be others who cannot attend on the day, we will accept written comments up to one week after the public meeting. Written comments are weighed the same as spoken presentations. For further details, please see the Notice for the Public meeting. From 1 March 2018, the Commission is legislatively required to publish an audio recording or written transcript of public meetings. This meeting will be recorded, with a written transcript published on the Commission's website. Personal information will be managed in accordance with the Commission's Privacy Statement. Any updates about the meeting will be published on this webpage and will be emailed to registered speakers before the meeting. My primary reason for objecting to this project is that confirmed reports from similar installations overseas have shown these facilities to emit cancer causing toxins and pollution resulting in cancer clusters and declined health of residents surrounding such constellations. For the government then to even consider this to be okay for the people in the proposed area is extremely concerning. I strongly object to the proposed incinerator being built so close to residential areas and the resulting decrease in air quality. I object to this incinerator being built as it will add to the already polluted atmosphere. Dad industries can’t confimr that deadly asbestos won’t be included in waste Burnt and this is not a risk I can offers for my 2 children and their future! I have 2 boys I am less than 2 km from proposed incinerator I am aware of how toxic it is and knowingly building something this toxic is virtually murder. I object to toxic waste poluting the air I breath when I’m only 1 km from the proposed location. I used to live in minchinbury and have 3 kids and knowing how toxic this incinerator would be considering that we live in the Sydney basin and have the highest rate of respiratory admissions in our western Sydney hospitals and deliberately building this is just murder of your own people, you don’t need to be smart , just google and you will find how many health and environmental problems. Working in the early education industry I have seen many children in my care with respiratory illnesses. The thought of having an incinerator within a stone's throw of my service worries me that many children will present with these illnesses when it can be avoided. I have 4 children and I don’t want the poison and toxic from the incinerator to affect the health of my children. If we need a incinerator why can’t it be built far away from any residential areas. Australia has a lot of other land why does this need to happen in western Sydney? Firstly I don’t want the incinerator to affect mine and my families health. I don’t understand why the incinerator needs to be in western Sydney when there is plenty of unused land in Australia! I have been living in the area for many years and do not wish to see children and families suffer from the toxic and pollution that is going to be caused by this incinerator! Why do we even need this when other countries are getting rid off it. I am heavily opposed to this facility going ahead, as I am seriously concerned for the health and well-being of the thousands of residents in the local area. We have seen a huge growth in population in recent years, and as such there is no place for a facility like this, that I feel will be impossible to guarantee the quality of the emissions released into the atmosphere from the burning of waste. Affecting all areas of health conditions & decreasing our value of life, my children go to the local school in Minchinbury & will affect all kids in area and surrounding schools, here’s no common sense in putting a toxin incinerator in residential area with many families young and old, sick and healthy , family pets , food distributors, workers & knowingly poising our present & future wellbeing. I strongly object to western Sydney being smothered in toxic chemicals in both my workplace and at my home. I am opposed to the plan to build and operate an incinerator at Eastern Creek. This is not some isolated area. It is an area with thousands and thousands of people whose health and wellbeing would be severely affected by the high levels of pollution, smoke and other hazardous chemicals being pumped into the air. Burning rubbish is something that happens in developing nations not here! I completely oppose this development. I have lived in Western Sydney all my life and I would like to raise my future children in Western Sydney. If this goes ahead I will be moving to another area or another State. NSW Government need to protect the health of NSW people, the EIS and the NSW Inquiry found this proposal to pose future adverse health implications and environmental implications. The proposed incinerator will be located with just kilometres of densely populated residential areas. My residence being one of these. This will impact traffic, air quality and the health of all in the area. Fact sheets and community information sessions have not effectively covered community concerns regarding this. For the health, safety and future of all locals, proposal should be rejected. Please listen to the people of Sydney. We object to the incinerator and so do tens of thousands. Including EPA, local councils, politicians, residents, schools, government departments, health authorities etc etc. Please put an end to this craziness and stop it. You have the power to listen to the people and protect the health of our children. Please do not allow this through. The facts are clear. I have children who have asthma and having this located so close to where our homes, schools, parks etc will cause unnecessary health problems. I object to this proposal on basis that air quality impact has not been confirmed risk free. In winter Blacktown area has poor air quality due to wood burners and this development would make it worse. It should not be built anywhere near built up areas especially Sydney basin. I can’t believe that such a development is even being considered. It has been rejected by officials concerned about the affects it my caused to the public. Both local and in the Sydney basin. I too have concerns about the possible toxic partials this development may produce so close to residential homes. 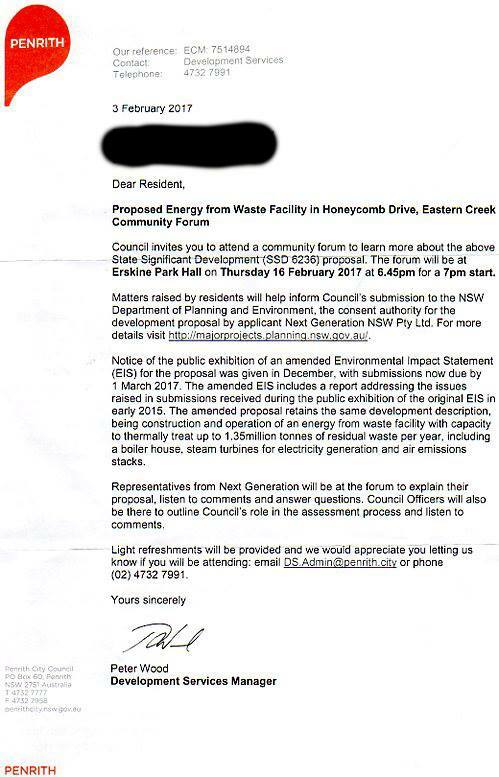 I object to the construction of the Incinerator at Eastern Creek in the grounds that it will add harmful pollutants to the air which will impact the health of my family. If Proposal fails to meet many government policies, in best interest of all residents & their environment, why do we have to fight so hard against this monstrosity ? Booming region where families can still afford to prosper & lead a decent lifestyle should not be denied or incinerated. I strongly object to destruction of family life in family suburbs. All facts against have been submitted already. I strongly oppose the proposed incinerator for Western Sydney. Western Sydney is often used as a dumping ground for the state's waste. We have a low socio-economic demographic which means that the people here are perceived to lack the resources and capacity to be able to strongly oppose such a proposal. Not only will it harm the environment but it will harm the people who live here. I live within a kilometre of the proposed site and care for my own health, the health of my family, and the health of my community. Such a facility is unprecedented, unsafe, unnecessary, and unethical. I chose to raise my children in Minchinbury for it's safety. It is a quiet suburb not connected to any other with a decent local primary school that educated each of my four children. The suburb has a small population and no traffic. This safety is compromised by the proposed incinerator putting profit before protection of children, affirmed by Environmental Protection Authority and NSW Health. My worry of the pollution it will cause in the area. Please reconsider the location of this plant, or better yet, scrap the idea in favour of a renewable energy source. Do not let this be our legacy upon the environment, locals health, and our future by creating this precedent of valuing profit above safety and wellbeing. I’m angry about their lack of concern for residents that would be surrounding the project. I also have asthma and am worried about having it triggered. I am an asthmatic and don’t want my family living next door to it. Don’t want the incinerator due to all the pollution it will cause. Because the proponent has a long history of violations of environmental and health regulations, so I have no faith in them adhering to the regulations of operating an incinerator. There is absolutely no way this can be good for the health of residents. Build it somewhere further from residential properties.